Family Legacy is always thankful for the caregivers we are lucky enough to meet and hear all about. 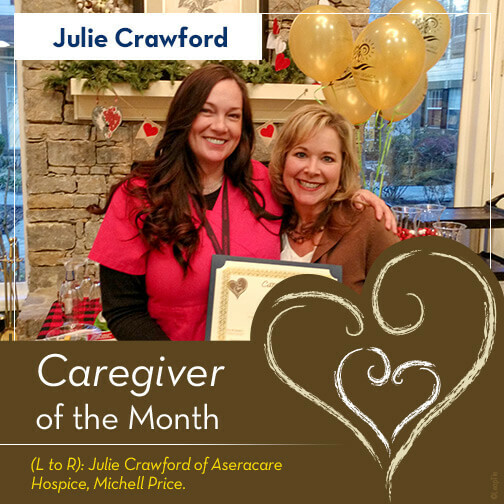 Our latest Caregiver of the Month is touching many lives in many ways and we are so happy to share the story of Julie Crawford, from Aseracare Hospice, with you! Julie Crawford does so many amazing things it is hard to know where to begin. She is the type to drop everything she is doing, forget about her own plans, and give all she has to her patients. There is no doubt about how much she cares and it comes across in one conversation about her “calling” in life. Julie cares about those she helps through her job, but has also been known to assist Veterans with a true passion and understanding for what they have sacrificed as well. She not only cares about end of life care but also helps the families of her patients and directs them through their next steps with love. Thank you Julie, for the compassion and care you show so many every day!